Once again I fail at getting this done before the next episode airs. But this one took a while because there was so much awesomeness that needed to be picspammed. Badass Gwen is AWESOME. Let's also take a moment to appreciate the fact the she used 1)her teeth and 2) a heavy blunt object to fight off two guys that are bigger and stronger than her. Good girl! - You're not going to have time to read, and they can trace us with that! - Well, I don't know, I haven't gone into hiding before, have I? - Now do you believe she's a terrorist? - She shot the wheels?! *rolls eyes* what kind of terrorist shoots your wheels?hmm? ROFL. 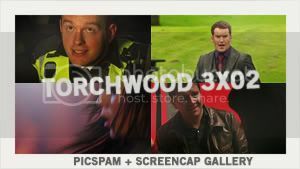 PC Andy was just hilarious for every single second he was on screen in this ep! - Well, let me carry the bag! - You want your trigger-finger free, don't ya? aww. Rhys loves being protected by his wive. There's no such things as using too many Gwen/Rhys pictures in a picspam. Nope! There's no such things as using too many pictures of a pretty scene in a picspam. Nope! Especially when it's got Ianto + Ianto's awesome sister (does she have a name?). "A thank you would be nice!" I love her. Okay, I didn't love Lois as much as everyone else seemed to in the first episode, because she was just sitting behind a computer and taking calls. but this episode she actually started doing things and it was awesome. "I'm a PA, this is what I do!"